HART would very much like to welcome those subscribers who have agreed to continue receiving regular updates. 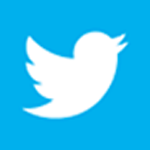 The newsletters will change format in July and go out monthly rather than every two months. 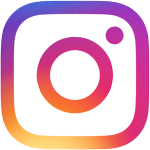 Any feedback and suggestions on communications are very very welcome. The climbing and trekking season have been at their peak over the last two months, and most appropriately, the annual HART vet trek to Everest Base Camp is now underway. The Everest Marathon takes place on 29th May. Two runners, Suman and Kiran, will be participating who we hope will be running for HART later this year in the Mount Snowden 100 mile Ultra race. 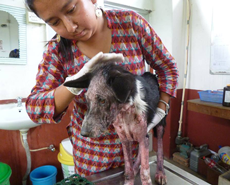 There has been a series of specially deserving cases at the Pokhara clinic over the past two months. For example, Coffee, a young street dog brought in by Mr Bishal Adhikari. See above and right. 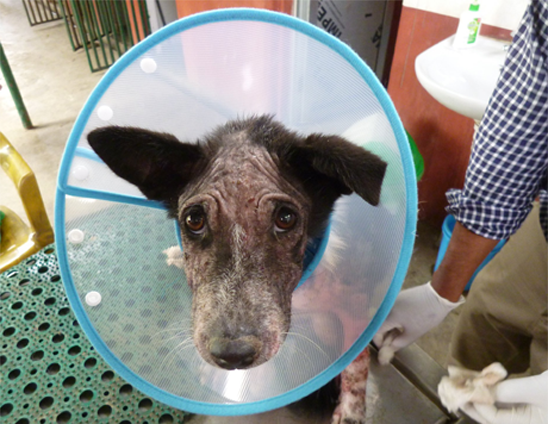 She has severe skin diseases, including mange and ticks, and will take many weeks to nurse back to health. Another special case is Bhunti the cat. Her elderly owner staff chatted to staff about the struggles of their life together while she was waiting for treatment. Bhunti had come close to being killed by a snake but had fought back and managed to survive. "If only I was rich enough I would feed them all but, alas, I can barely manage for me and my husband." She added that people had advised her to throw Bhunti into the Seti River Gorge because they believed the cat had caused itching that needed medication. 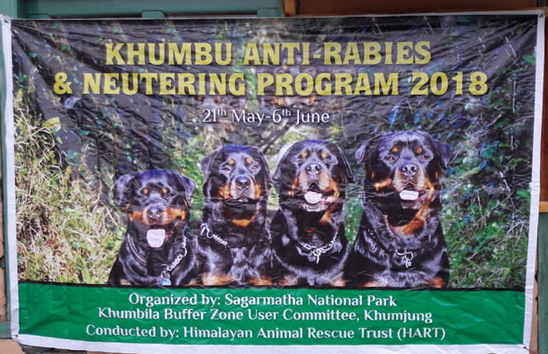 The mass anti-rabies vaccination programme has begun. This screen shot from the Dog Data website shows the gradual progress throughout the wards. 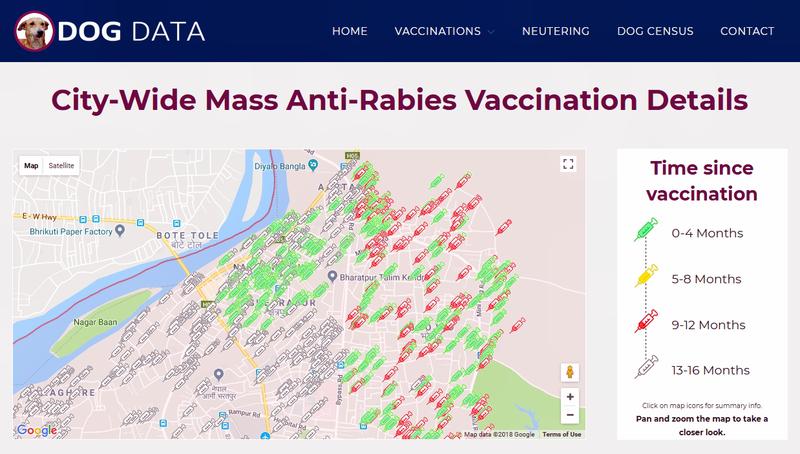 The latest injections, shown on the map as green syringes, will take over from the old fading ghost syringes, ensuring continuing protection for dogs and people in the town. Visit DogData to zoom in and watch progress. Both teams spent a large part of April carrying out clinics in eastern Nepal to build on previous work and to reach new areas. 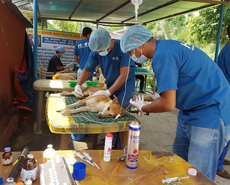 The teams started in the town of Bhadrapur where 202 dogs were neutered and vaccinated over 5 days with the assistance of the Mayor, Mr Jiwan Kumar Shrestha, and Mr Kumar Sing Katri of Japha DLSO. 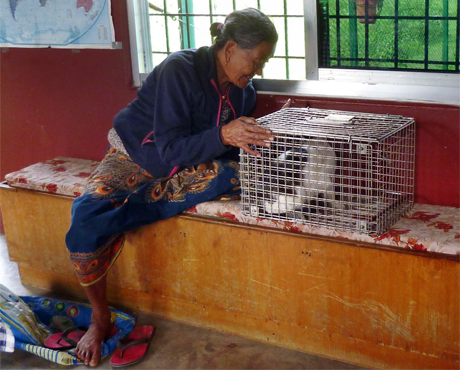 The teams then spent a week in two locations in Buddha Shanti, a rural municipality where 266 dogs were neutered. Finally the teams moved on to Dharan. 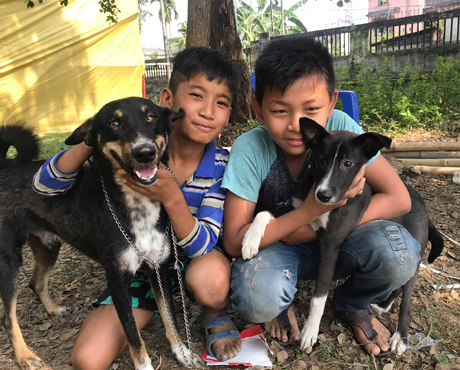 Since very welcome sponsorship had been received from Dogs Trust International it was possible to attempt to ensure that at least 70% of the female dogs in the town and 30% of the male dogs were neutered. As in previous visits Mr Shanku Shrestha of Pets Home and the officers of the Dharan Sub Metropolitan provided extra staff, facilities and organisational input. The programme achieved its targets and the teams returned to their bases, exhausted. 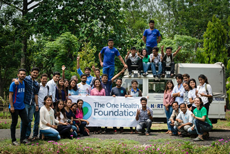 HART has worked with the AFU for many years and is now delighted to have the chance to collaborate with the newly established One Health Foundation. A small animal surgical training course was held in April and it is hoped that these courses will be repeated and expanded over the coming years. A week long clinic was held in Hetauda in early May. The partners in this were HART, Mr Shretha of Pets Home, Dharan, and and the offices of Hetauda Sub Metropolitan and Makwanpur, DLSO. Mr Hari Bahadur Mahat, the Mayor of Hetauda Sub Metropolitan, kindly inaugurated the programme. A total of 175 animals were neutered. This is underway at the moment. The programme is now in its third year and full details will be published in the next newsletter. HART would like to gratefully acknowledge everyone who has contributed to the Chuffed campaign and enabled the extra equipment to be bought. Sincere thanks are also due to Vets for Compassion who carried out a delicious and innovative high-tea fundraiser in April. Additionally a very generous Australian donor has given remarkable support which has boosted both finances and morale. JustGiving and Vodafone have kindly provided us with a JustTextGiving facility. 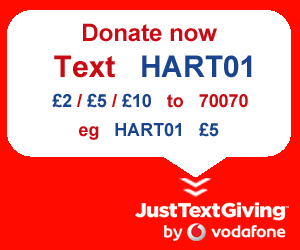 This enables you to make a text message donation of £2, £5 or £10 to HART, directly from your mobile phone. All text donations are free, and won't come out of any inclusive texts you have as part of your price plan - even if you're not with Vodafone. You just pay the cost of your donation. 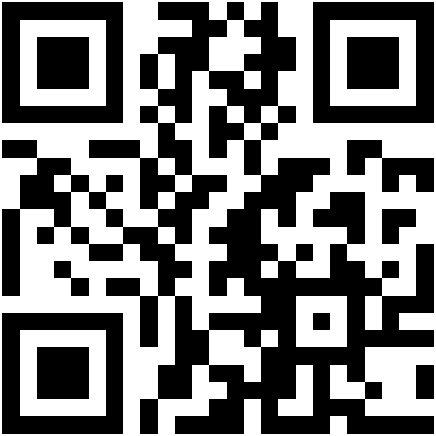 Or, if you have a QR reader, simply scan this QR code to prepare your phone for sending £5 to HART. A little goes a long way in Nepal. For example, your £5 would provide anti-rabies vaccines to protect more than 10 dogs for a whole year.